I was wondering: FeedBurner was acquired around 2011 by Google. Google announced that the feedburner API is going to be no longer available. 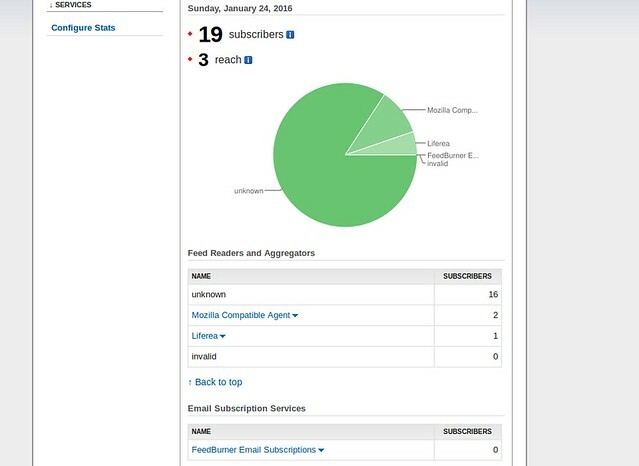 My intent to use this tool was to track how many people sign up and how many people subscribed to it. 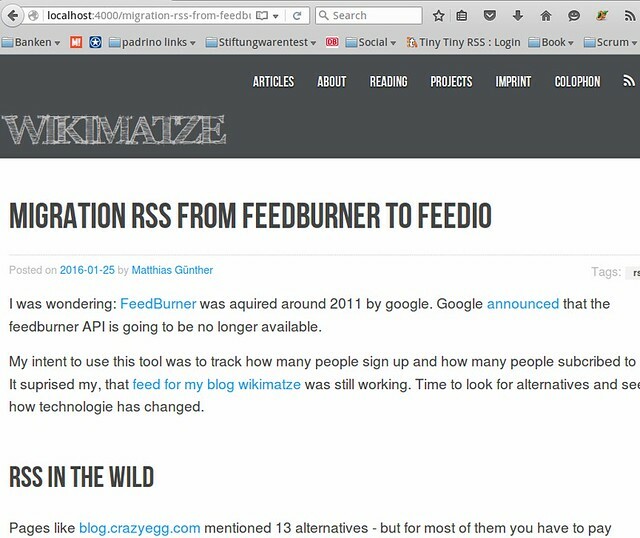 It surprised my, that feed for my blog wikimatze was still working. Time to look for alternatives and see how technology has changed. Pages like blog.crazyegg.com mentioned 13 alternatives - but for most of them you have to pay money. There are many wordpress plugins out there but since I’m using jekyll to build my site as a static HTML page, that is not even an alternative. The site feedburner-alternatives.com mentions tools like feedblitz and specificfeeds.com. 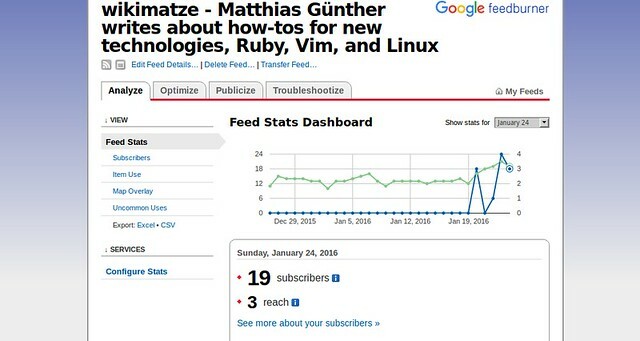 I tried feedblitz and created an RSS-feed of wikimatze.de but wasn’t satisfied with the statistics and handling. Than I stumbled across Danny Browns’ post about if you blog really needs RSS. The author may be right that E-Mail subscribers are more open to change and that you can inform then more easier with new information (like changing the URL of your RSS feed). I still like using RSS feed and using Tiny Tiny RSS to manage my feeds - there is even an app from which I can read new on the road. 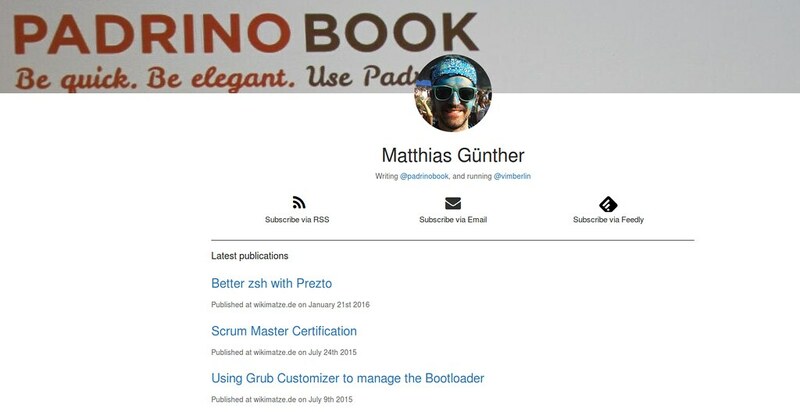 But I have also gathered positive experience with building up a mailing List for my PadrinoBook with mailchimp.com. Why not taking both? This is what Danny Brown talks about in his post how he changed his mind about RSS. He mentioned a tool called feedio.co which should take care of this issues. I will show you some features of the tool in the last section of this article with some images. I made the error to link my RSS feed direct to feedburner. That means, that first all the traffic goes to the external service and second when I change the URL, my readers will not be informed about this. The good part is: I had no subscribers so I don’t need to contact anyone. The bad part: I will probably lose my 19 subscribers of my old feed. Before I go on, I’ll shortly explain the ways you can use to link your RSS feed. Decide if you want tracking or be lord over your domain. A mix between the two is also possible, let’s say you offer visible RSS on your site which points to some third-party tool (like feedburner) and keep the <link href="/atom.xml" ... on your site. But you need to be careful with your redirect: Ask the service you want to use, if a redirect is okay - not that their crawlers have problems with the loop. It’s very easy to setup. All you have to do is to sign up with your twitter account. 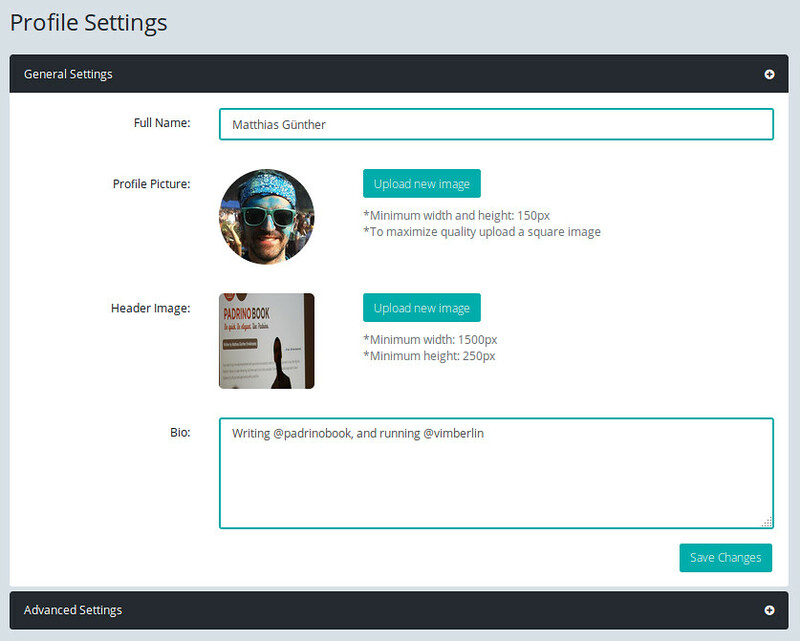 Your picture and bio will be taken automatically and you have to submit a link of your feed. will we be able to crawl it. I checked my RSS feed under rssboard.org and could see that my feed was not ready. This was also a good point to watch what formats are possible. You can get a nice overview atomenabled.org. If you want become my first RSS subscribe, you can do that here. They have many things on their agenda - let’s see where the voyage will go.